The author starts off this chapter explaining that when we read closely for text structure, "we begin to see the underpinnings of the author's intentions...what the author values." It can help us to think about the choices that an author makes and helps us to realize that text structure reveals a lot about what the author wants the readers to know. 1. Read through a lens. Describe the organization of a text and the purpose of that organization. How are parts similar/different? What purpose do they serve? About characters or whole text. 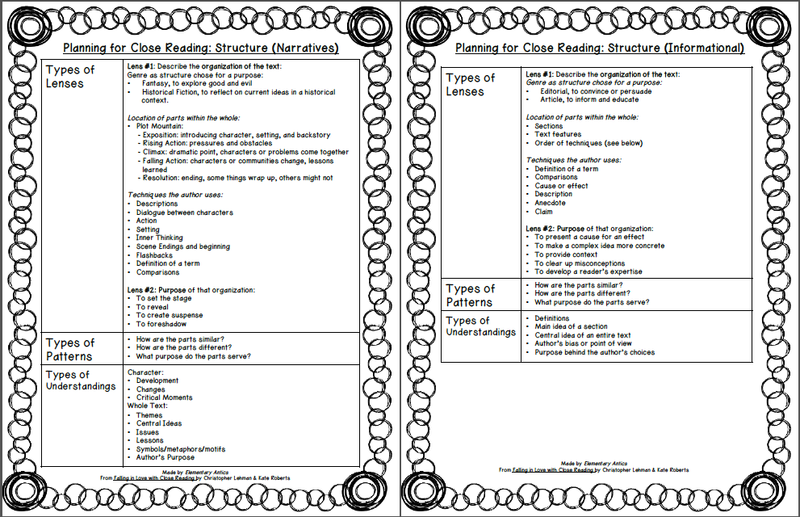 I created a little "cheat sheet" of the Planning Support to think about when you're close reading for structure (for narrative and informational texts). Click the picture below to download it. In narratives there are a few main ways to talk about text structure: talking about genre (poem, editorial, news report), talking about the locations of parts within the text (second subsection, stanza, change in scene, using the parts of a plot mountain), and talking about techniques that authors using when structuring a text (character description, dialogue, setting, comparison). The sample lesson that was discussed was from the book The Tale of Two Cities and done at the high school level. One strategy that I liked that they discussed using during close reading was for students to jot the description that they are seeing in the text on the left side of the page and the purpose for that part on the right. This really helps students to to read looking for parts and trying to see where the author moves from one technique to the next and think about exactly what that part is and what purpose it's serving. I do think that elementary kiddos could do this too. Obviously, as I was reading I was thinking about how this could be done at the elementary level. I do think it would be really important to make sure that students had a really clear understanding of all the techniques that are suggested, so lessons would definitely need to be done on those techniques as well as story structure in general and genre-specific vocabulary before I feel like I could delve deeply into close reading with structure. In fact, some of the extra support lessons suggested were to teach students to think about the sequence of events as another lens to start. 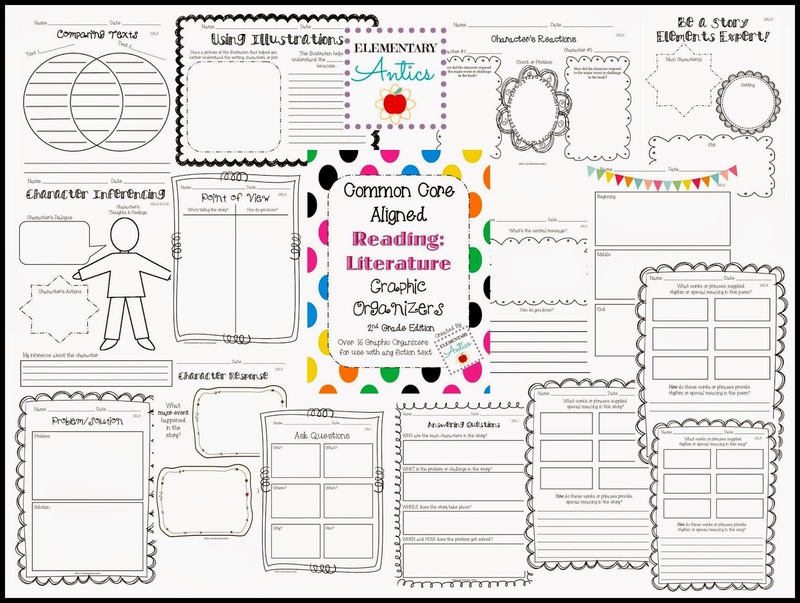 I've got a fun and easy to use Graphic Organizers Pack (CC aligned) that I'm definitely planning on incorporating into close reading and other activities this year. Check it out by clicking the picture below. So, I'm still wondering- What fiction/non-fiction texts or articles have you used effectively when teaching close reading? Does a book come to mind for reading closely about structure? Enter to win your own copy of Falling in Love with Close Reading using the Giveaway Tools below!